Best of the Area! You don't need to look any further! These are our favorite places in the area. Whether you're looking for a place to stay, a place to eat, a great tour company or a real estate agent, this is the place to start. Jungle Lodge with tropical contemporary architecture located in Playa Chiquita, a few steps to the beach. Accommodation options are double or triple rooms, bungalows for 2 up to 8 people and a suite room with private swimming-pool available for honeymoons/couples or family up to 9 members. Services include free breakfast, swimming-pool, bar, free wifi, parking, desk for tours and transportation, concierge and laundry. Upscale hotel with individually art designed bungalows. French restaurant. New swimming pool with waterfall, surrounded by a tropical garden. The tree house are 4 very unique luxurious houses build in balance with nature. The tree house is located on the Iguanaverde Foundation property. The lodge is located at a 10 acres ocean front property between Playa Chiquita and the Punta Uva beach. Tropical Beachfront Boutique Hotel with 22 rooms Located on the quiet sandy beach of Playa Negra. Banana Azul is limited to adults over age of 16 and offers restaurant, bar, pool and tour kiosk. Beach views, tropical gardens, comfortable rooms & friendly staff make for memorable vacations. Based in the lush tropical rainforest along the beach, inspired by seafaring Vikings and the colors of the Caribbean, Guesthouse Casa Vikingo is a brand new option for visitors to Puerto Viejo. 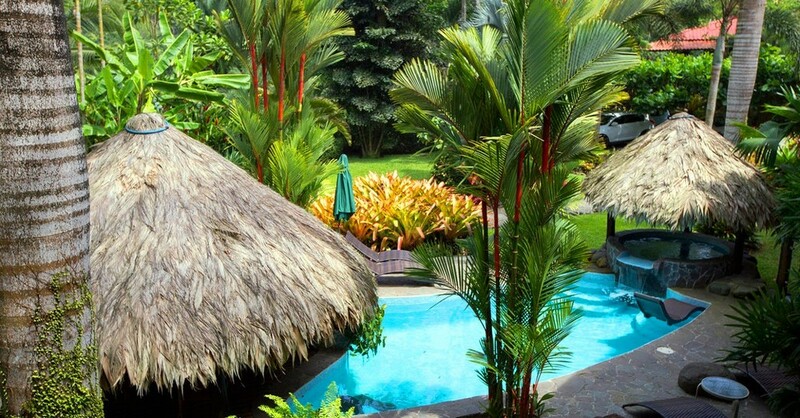 A delightful retreat with a sparkling pool in lovely jungle surroundings, with easy access to restaurants, adventurous excursions, and that unpolished pearl, Puerto Viejo. Offering rooms and fully equipped apartments. 12 rooms artfully decorated. Warm hospitality. Tropical garden … a piece of paradise 200 m. from the beach. Safe and private and a lush, tropical garden refreshes the environment and view with all of its fantastic flowers and tones of green. Rooms all come with private bathroom, fan, mosquito net and a safe. They are cheerfully designed and painted in fun Caribbean colors. 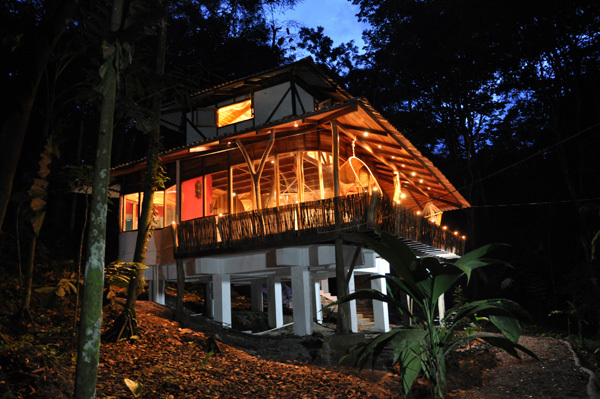 Located in heart of Puerto Viejo. Rooms and 2 bedroom apartments with kitchenettes. Satellite TV and air conditioning and free wifi. Great for families. Secure parking. Caribbean style bungalows in tropical garden just 150m from beach, in the midst of tropical vegetation. 4 acre property with new pool, beautifully planted garden, surrounded by giant trees. 6 comfortable, different sized bungalows, which offer space for 1 - 4 persons, some with kitchens. 4 rooms , 2 with A/C for 1-4 persons. And 3 private houses with kitchen and A/C for up to 6 persons. 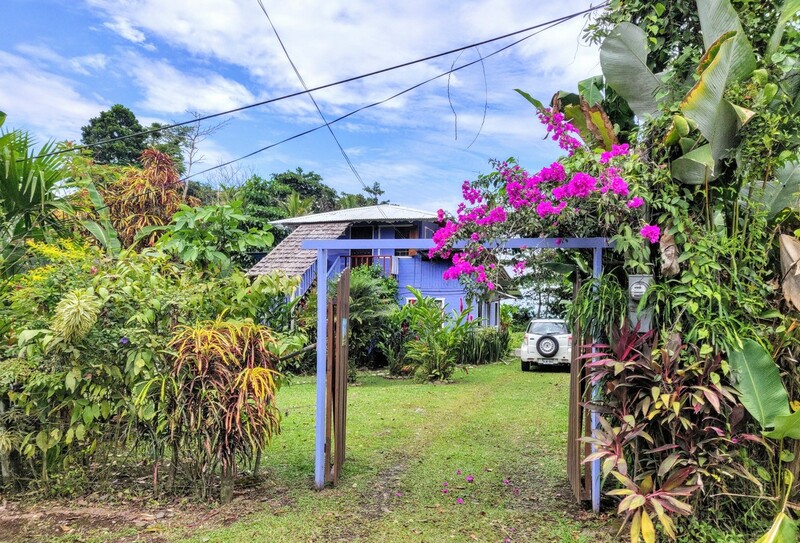 Located just a 5-minute walk from the heart of Puerto Viejo, Lizard King is known for their hospitable staff, comfortable and clean rooms air conditioned rooms, swimming pool and restaurant serving breakfast, lunch and dinner. Luxury boutique hotel opened in 2018 with rooms and 2 bedroom apartments set around a pool. All rooms with terrace, A/C, Wi-fi. cable TV, minibar, in-room safe. Facilities onsite include the Mar y Sal restaurant and Umami Spa. Representing properties for sale throughout the South Caribbean of Costa Rica. Staff speaks English, Spanish, French, Dutch and Portuguese. Full service in-country travel assistance provider based in Puerto Viejo with a satellite provider in the capital San Jose offering trips to exciting destinations all over Costa Rica. Their goal is to offer the best possible vacation experience to all clients, including the LGBT community. Whether their clients are looking for tours, transports, hotels or full multi day vacation packages they are there to assist them every step of the way. Semi-private shuttle service to many destinations in Costa Rica. Services to/from Puerto Viejo include Bocas del Toro, San Jose, Limón Airport, Arenal, Tortuguero and San Juan del Sur. Packages for Bocas and Puerto Viejo are also available. Wifi now available on most shuttles! Offering a full selection of local tours, they can arrange rafting, canopy, snorkeling, wildlife watching and many more activities. To get around Costa Rica, they are happy to arrange a private van or shared shuttle for you. And can reserve hotels and vacation rentals that fit your needs and are stylish and unique. They work Costa Rica wide and in Panama and Nicaragua and can arrange your entire trip to any of these countries. All their packages can be tailored just for you. A gorgeous vacation rental right on the beach. 2 bedrooms each with A/C and ensuite bathrooms, pool, secure parking. A lovely view of the beach from the decks. Garden, kitchen, living and dining room. Lovely ocean views and breezes. Sleeps 4 people (2 twin beds or 1 king bed in each room), an additional 2 children can sleep on the day beds in the living room. El Árbol (the tree) is a vacation house & jungle villa rental. Fascinating jungle experience in the Caribbean rainforest of Costa Rica. This lodge on 16+ acres of private property is situated in the wildlife refuge, with the beautiful Caribbean sea only about a kilometer away. You will stay in one of the luxurious, fully equipped houses on stilts. Experience the jungle like never before. 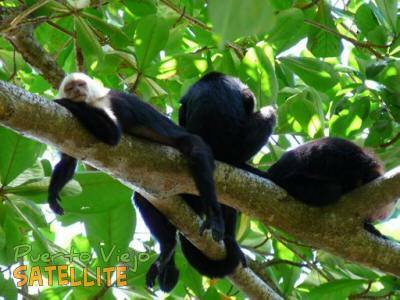 Have the monkeys waiting outside your window as you wake up to the sounds of tropical birds singing. There are sloths, nosebears, other mammals, frogs, and so much more. A glass tower with 4 bedrooms which can be rented individually or as a vacation rental. Located just steps from the beach in Cahuita. The swimming pool, sundecks, kitchen and tropical garden are all available to guests. Magic Moon Beach House is truly beachfront, only 50 meters away from an ocean you can see and feel! And if you have ever been on the sandy shores of Puerto Viejo and seen the moonlight ripple across the night sea, felt the warm, salty breeze, heard the coconut's leaves rustle above you, then you may be under the spell of Mother Earth's irresistible beauty. That's why this place is called Magic Moon. It can be rented in either 2 or 3 bedroom configurations. And the house of course comes with all the modern conveniences. Beachfront privacy on black beach. There are two options for you to choose from: a second floor studio with deck or downstairs there is a 2 bedroom/1 bath unit. Six villas in a very private & peaceful location. Short stroll to Playa Chiquita beach and restaurants. Two 2 bedroom, three 1 bedroom and 1 studio recently constructed separate villas, each with private garden space, fully furnished, kitchen with all utensils. Built to a high standard, using many indigenous materials, hand crafted furniture. Available for daily, weekly & monthly rentals. Min 2 nights. 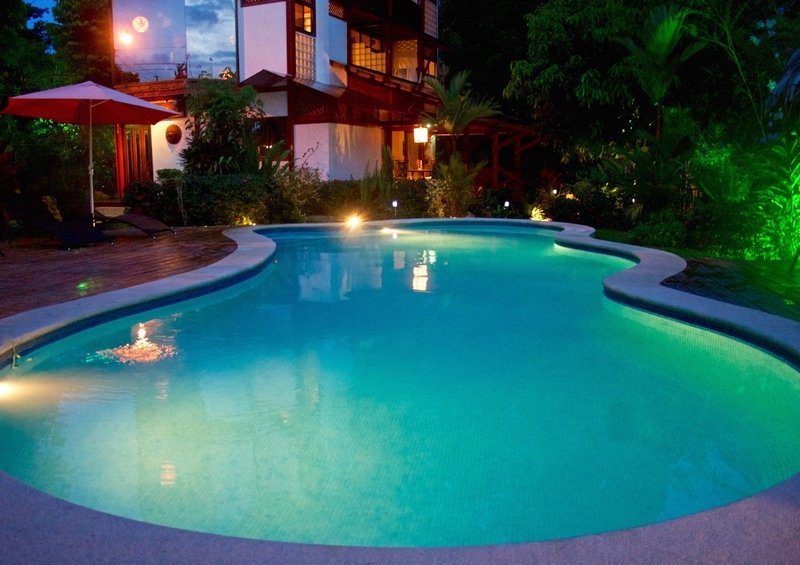 Puerto Viejo's newest vacation rental option at Hotel Banana Azul in Playa Negra. Owned and operated by Hotel Banana Azul, Villas Banana Verde boasts 2 stories, private gardens, your very own private "cool" plunge pool, full kitchen, king bed, sleeps 4, 2 baths, AC and an outdoor dining area. Access to all of the amenities that Banana Azul offers, Azul Beach Club's seaside service, pool, restaurant and their in-house tour company, Caribe Fun Tours.